Hey everyone! Just a quick heads up. This page will no longer be used. The new home of the Ontario Blog Squad can be found at www.ontatrioblogsquad.com so please update your bookmarks and be sure to visit us at our new location for all the up-to-date news on what is going on with the Ontario Blog Squad! Nicole, Michele, Wendy, Liz, Christa and Angel! On Saturday, November 3, 2012, over 70 Ontario book bloggers, publishers, and authors met up in downtown Toronto at the Watermark Irish Pub for an amazing afternoon of book-related fun! For many people, it was a day to finally put a face to a name after months of online chatting, a chance for bloggers to meet their fave authors, and an opportunity to greet the book fairies who work at publishing houses. Just when I thought there were no more tote bags to come, Nicole appeared with more boxes filled with books and swag to give away! Everyone who attended the event received a copy of Elizabeth Miles's Envy and a HCC Frenzy magazine, which we distributed to all the tables. In no time at all, we also had an extra table completely covered with books like Libba Bray's The Diviners, Julie Kagawa's The Lost Prince, Beth Fantaskey's Jessica's Guide to Dating on the Dark Side, Maria V. Snyder's Inside, Robin LaFever's Grave Mercy and more. The event officially kicked off at 1 p.m. with a steady trickle of bloggers coming in, introducing themselves and then taking a seat. Michele and Angel checked people in, crossing off names and handing name tags to everyone which included our names, twitter handles, and blog names. 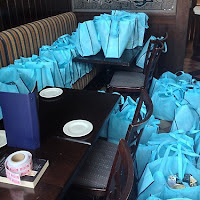 Wendy helped to hand out blue tote bags to each person filled with goodies... and I'm not sure how anyone could not resist peeking inside right away! Soon enough, the restaurant was filled with the loud chatter of hyper book bloggers, and arriving authors guests and publisher contacts. When we organized the Meet-Up, we wanted to keep the event casual, yet intimate, and I think we accomplished this. We encouraged everyone to mingle and not be afraid to introduce themselves to others. It was very difficult to stay in one place when there were so many new people to meet and familiar faces to greet once again! After everyone had arrived, we managed to get everyone to quiet down a few moments. (Everyone may think bookworms are quiet and shy, but bring them all together in one place and we're LOUD.) Nicole took charge and introduced us Ontario Blog Squad members to everyone in the crowd, and then Jen later took over to point out where we could find the special author guests sitting in various spots across the room. If you've been keeping up with the announcements on the blog, you'll know we were thrilled to have nine authors join us at the event: Lesley Livingston (author of Starling), Allison Baggio (author of In The Body), Brian Francis (author of Natural Order), Grace O'Connell (author of Magnified World), Susin Nielsen (author of The Reluctant Journal of Henry K. Larsen), Elizabeth Miles (author of Envy), Maureen McGowen (author of Deviants), Joanne Levy (author of Small Medium at Large), and Cinda Williams Chima (author of The Crimson Crown). 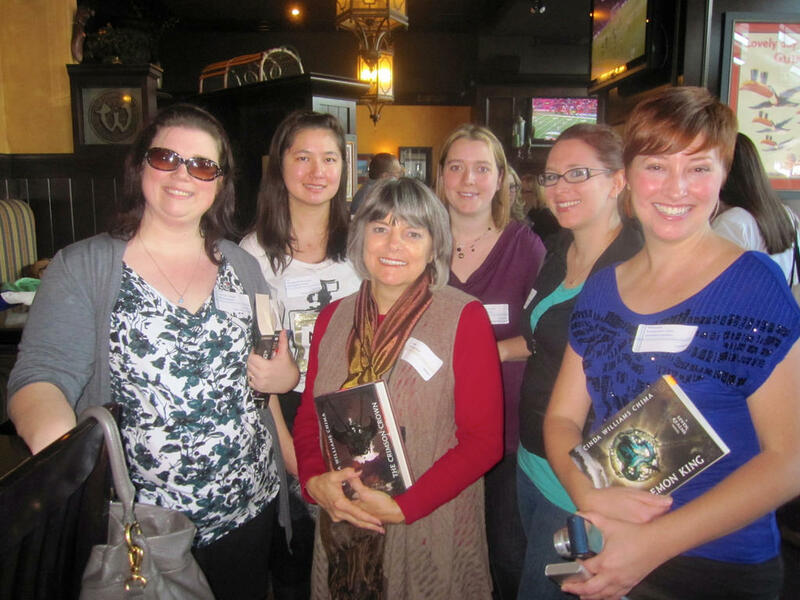 Bloggers and Authors at the OBS 2012 Meet-Up... Can you spot authors Joanne Levy, Maureen McGowen, Susin Nielsen and Elizabeth Miles? After the general introductions, everyone was free to walk about the huge area of the pub that was dedicated to the Meet-Up! Last year, the venue choice was a bit difficult to really mingle and meet people, so we were more confined to sitting at our tables, but it was much easier this time around to venture around. During the lead up to the event, we helped to encourage people that the Meet-Up was a great opportunity to swap books with other bloggers and they sure took our advice. I saw plenty of stacks of books and quite a few people brought mini suitcases on wheels to transport them! 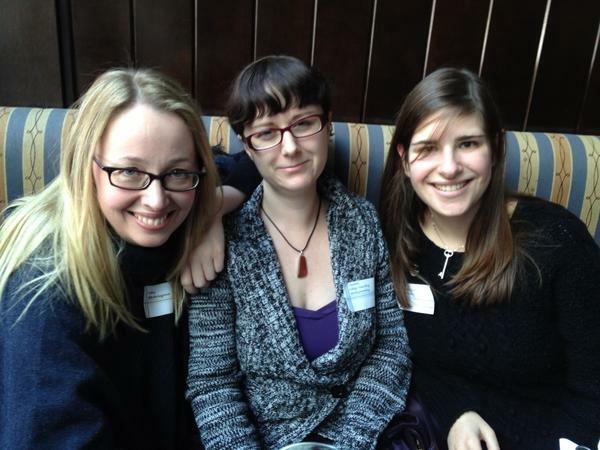 And for bloggers, the event was also a great opportunity to meet with marketing contacts from publishers to say thanks for all the awesome books they send for review, or to introduce themselves if they hadn't met before. 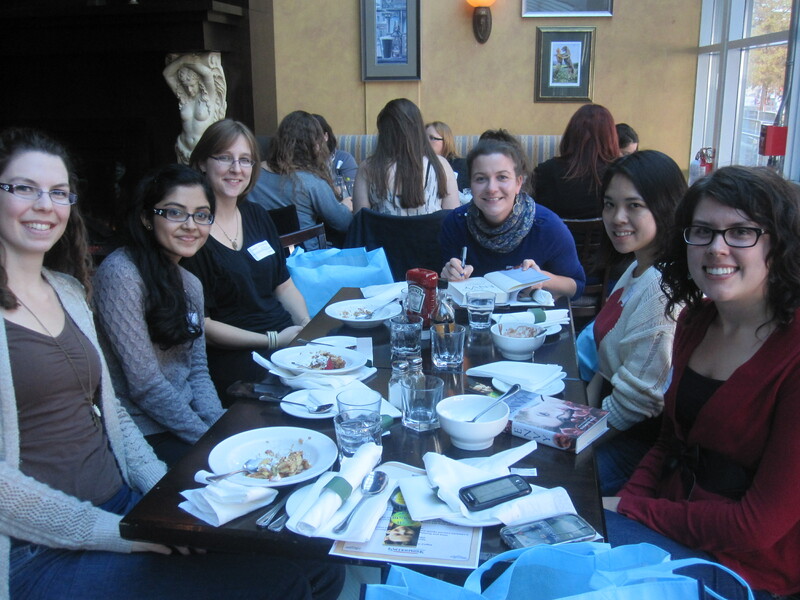 Lindsey from Random House Canada, Pamela from Tundra Books / Random House Canada, Vikki and Shannon from HarperCollins Canada, Michelle from Simon & Schuster Canada and Amy from Penguin Canada were some of the publishing representatives we were absolutely delighted to have joining us at the event! We didn't have any official book signing times, so attendees were also free to grab their books and have them signed by the authors whenever they had a spare moment in between chatting with fellow bloggers. Sometimes when you go to a book signing at a bookstore, you don't really get a chance to talk with an author for very long, but the Meet-Up really gave you a chance to converse with the authors for a longer portion of time. I don't think I'm alone in thinking we were all too busy happily talking about books to remember taking more pictures of the event! It was only when our lunches arrived when many of us began to take our seats. 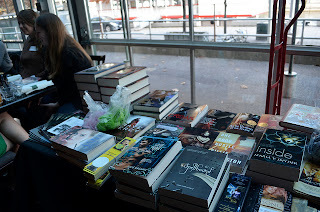 When it was already around 4 pm, we began to raffle off more books! If an attendee's lucky ticket number was called out, they were able to pick one of two books from the raffle table. And since we also had a few more boxes filled books that had been dropped off by Dan from Raincoast Books, Jenn H and I went around to each of the tables offering such books as Janet Gurtler's Who I Kissed, Jo Weiner's Among Others and Chevy Stevens's Never Knowing to whomever wished to have a copy if it sparked their eye. But like most things in life... all good things come to an end. 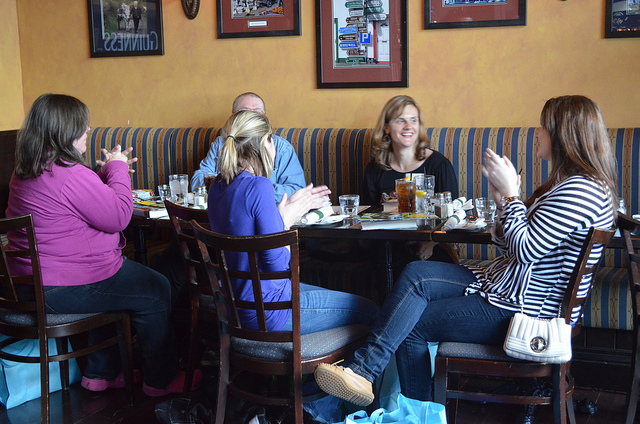 We officially ended the 2nd Annual Blog Squad Meet-Up at 4:30 p.m., but most of us were reluctant to leave right away. We were honoured to have Lesley Livingston close the event for us, thanking all the bloggers for their hard work in taking the time to spread the word about their books. The day would surely not have been nearly so successful without the support and generosity of the following publishers: Raincoast Books, Thomas Allen & Son Ltd., Random House Canada, Simon & Schuster Canada, HarperCollins Canada, Penguin Canada, Kensington Publishing, Harlequin Teen, Scholastic Canada and Hachette Book Group Canada. Thanks so much! As well, thank you to Elaine Levine, Cassandra Carr, Linda Poitevin, and Anna Hope for reaching out to us, and providing books and swag to give away to attendees. And a warm thanks is also extended to authors Joanne Levy and Maureen McGowen for providing books for door prizes and the raffle draws! And what's that? You'd like more pictures from the event? Here's some more! 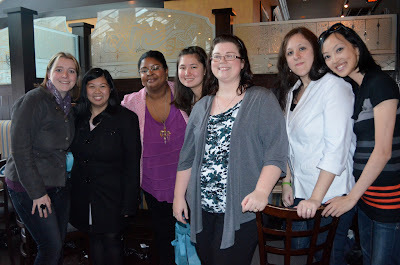 On behalf of the Ontario Blog Squad, we'd like to thank the bloggers, publishers and authors who joined us at the event! It's hard to believe that after months of planning, organizing and anticipating the big day, it's already over and we're left waiting for the next time we can all see other again! 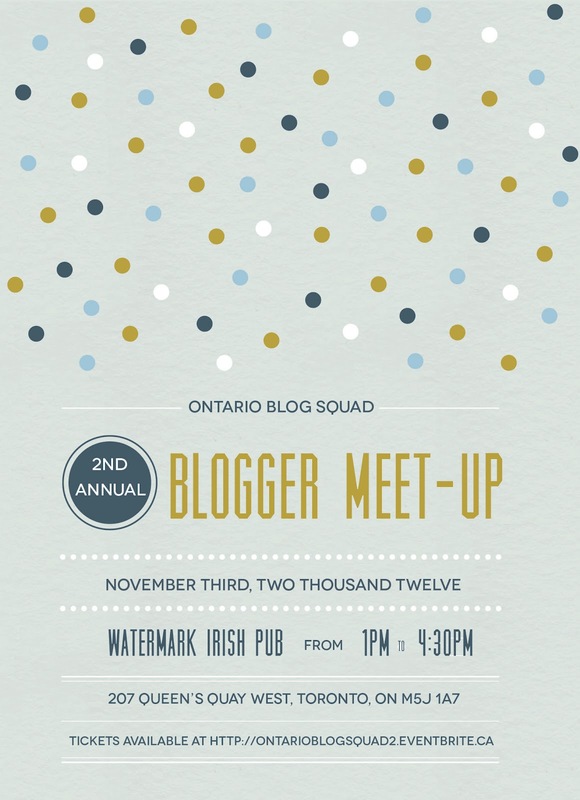 If you attended the 2nd Annual Ontario Blog Squad Meet-Up, we'd love for you to link up and share your blog recaps and pictures below. And if you weren't able to make it to the Meet-Up, we still have extra copies of books... so be on the lookout for upcoming giveaway posts on the blog! 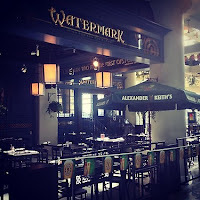 I am back once again with another FAQ post for the Second Annual Ontario Blogger Meet-Up that is taking place on November 3, 2012. For those of you who are registered to attend, I know I can speak on behalf of my fellow organizers when I say, that we are so excited to see all of you this Saturday. The response from the book blogging community has been absolutely amazing and we are looking forward to putting on an awesome event. Now a lot of you have been asking us questions on twitter and we have been doing our best to answer them. But here is a comprehensive post of some more FAQ's for you all. Now out of the group of organizers, Michele and I tend to be the navigators of the group. So when people began asking for directions and trying to decide on taking the train in to Union or driving down, we weighed in on the debate. For those of you who are still undecided, here are the directions. Exit Union station on Front Street and make a right onto Bay Street. Take Bay street south to Queen's Quay. Make sure you cross the street as you want to end up on the South West side of Bay & Queen's Quay. Head west on Queen's Quay until you reach a building called Queen's Quay terminal. Hint: It's right on the water and has a Sobey's located in it. 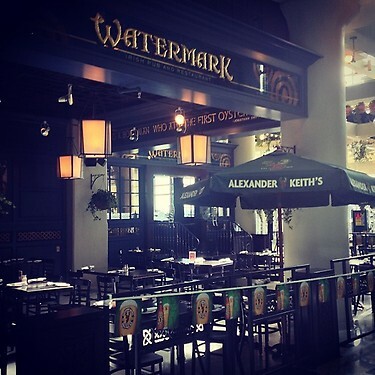 Head inside the building and make your way through the shops to the Watermark Irish Pub. A map, courtesy of Michele and Google maps, of your route is below. The entire trip takes about 15 minutes. Direction from Union Station to the venue. You can also take the TTC. If you decide to take the TTC, please be advised that the fare for an adult is $3.00 each way. At Union Station, customers must board buses on the west side of Bay Street, just south of Front Street. You will be taking the 509 Harbourfront bus from Union Station at Bay Street and Front Street to the York Street stop. Take the York Street exit from the Gardiner Expressway. Harbourfront Underground Parking Lot Located to the west side of the building. Located across the street from the building. So there will be a 8 authors at the event this weekend. We know that you guys are excited to meet them and get books signed. We ask that you stick with a signing limit of 2 books for each author. *Note* courtesy of Simon & Schuster Canada, there will be a finished copy of Envy by Elizabeth Miles for every attendee available at the event. to get signed. Please also remember that this is a casual event. There will be no official signing period, but we ask that you not interrupt the authors while they are eating to get books signed. Also, don't forget to check out my original FAQ Post here. 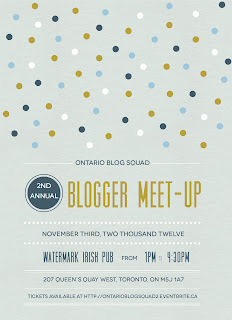 Are you ready to hear who will be the ninth and final author guest for the Second Annual Ontario Blog Squad Meet-Up? 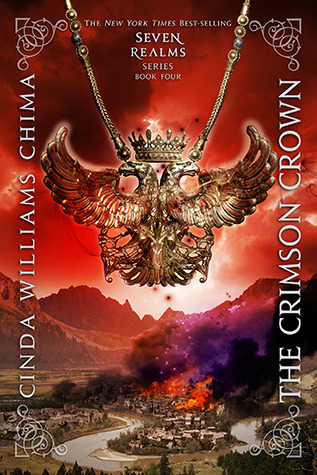 It will be... *drumroll* ... Cinda Williams Chima! 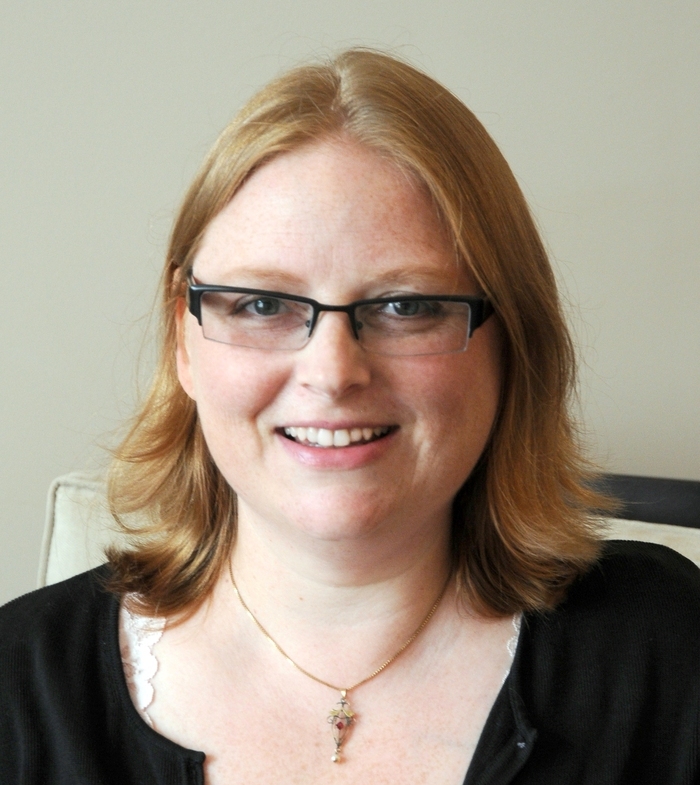 Our eighth author guest for the Second Annual Ontario Blog Squad Meet-Up is... *drumroll* ... Joanne Levy! After much teenage misadventure, Joanne eventually graduated from university and now spends her weekdays as an executive assistant at one of Canada’s big banks planning meetings and thwarting coffee emergencies. 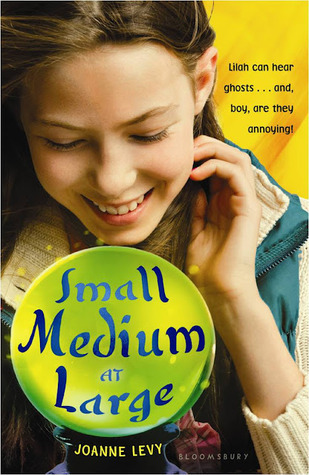 When Joanne isn’t working, she can usually be found at her computer, channeling her younger self into books. Joanne still lives in Ontario with her husband and kids of the furred and feathered variety.